President Donald Trump delivered a message of defiance as he spoke at a 9/11 memorial service, saying the US would "never ever submit to tyranny". The American leader spoke at a ceremony in Shanksville, Pennsylvania, where hijackers crashed California-bound Flight 93 into a field on 11 September, 2001. He paid tribute to victims at the new memorial as several services took place around the country to mark 17 years since the terror attacks. 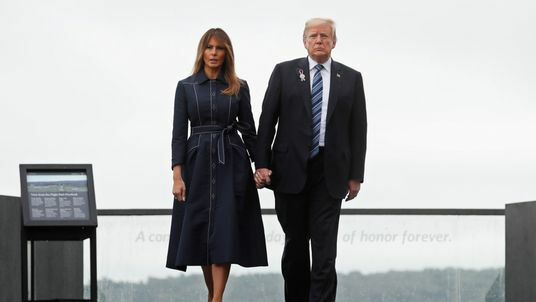 "We are here today to pay solemn tribute to the 40 passengers and crew members on Flight 93 who rose up, defied the enemy, took control of their destiny and changed the course of history," the president said. "Today we mourn their loss, share their story and we commemorate their incredible valour... we remember the moment America fought back." The 40 passengers and crew members on board attempted to regain control of the jet after speaking to relatives on the phone and learning the hijacking was part of a larger plot targeting the World Trade Center in New York. "Today all of America wraps up and joins together, we close our arms to help you shoulder your pain and to carry your great, great sorrow," Mr Trump said. "Your tears are not shed alone for they are shared grief with an entire nation. "We grieve together for every mother and father, sister and brother, son and daughter, who was stolen from us at the twin towers, the Pentagon and here in this Pennsylvania field. "We honour their sacrifices by pledging to never flinch in the face of evil and to do whatever it takes to keep America safe."